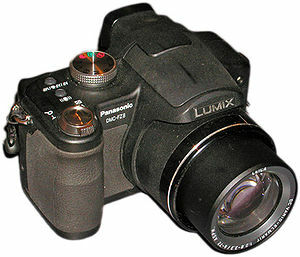 The Panasonic Lumix DMC-FZ8 is a 7 megapixel superzoom bridge digital camera made by Panasonic. As with most Panasonic Lumix cameras, it uses a Venus Engine, in this case, the Venus Engine III. It supports the Raw image format and has the same sensor size and zoom level as its predecessorm, the Panasonic Lumix DMC-FZ7. The DMC-FZ8 became available in the United States in February 2007. The DMC-FZ8 has several improvements. In a review, CNET gave the camera 7.5/10 stars, praising the camera's fast zoom lens; joystick and manual controls; optical image stabilization system; compact size; and raw image format. However, they criticized its image quality, misleading optical zoom labeling, and noise issues, as well as the ISO 3200 option being hidden in a specific usage mode, though they noted that may be beneficial to users as the manual specifies that the ISO 3200 would blur much useful detail. Overall, it was described as a decent camera for beginners or intermediate users. ^ "Panasonic Lumix DMC-FZ8". Digital Photography Blog. Darren Rowse, Australia. 2007-01-31. Retrieved 2008-07-05. ^ "Panasonic Lumix DMC-FZ8 Review". DPReview. Retrieved 2019-02-24. ^ Ryan, Philip. "Panasonic Lumix DMC-FZ8". CNET. Retrieved 2019-02-24. This page was last edited on 24 February 2019, at 03:07 (UTC).